This job aid contains aerial color photos of oil on water to assist in identification of thickness, structure, and estimated volumes of oil on the water. An expanded section about False Positives. The hard copy version has been printed on new "plastic paper," which is waterproof and tear-proof compared with the laminated pages of previous versions. Introduction and basic overview of how to visually assess spilled oil. Glossary of standard terms used in pollution response. Codes you will use to describe oil colors and structure/distribution. Chart for visually estimating the percent coverage of spilled oil. Thickness and concentration values for each of the oil color codes. Checklist for organizing and recording observations of spilled oil. Photos showing different types and distributions of oil on water and common response activities, with example text showing how to use standard terminology to describe each scene. This job aid was originally a joint project of NOAA's Office of Response and Restoration (OR&R) Emergency Response Division (ERD) and the U.S. Coast Guard. Photos were contributed by NOAA, U.S. Coast Guard, Washington Department of Ecology, the Alaska Department of Environmental Conservation, the oil industry, and Alan Allen of Spiltec, who deserves special acknowledgement for sharing his knowledge and vast experience on how best to observe oil from the air. 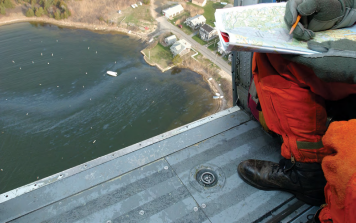 Training: Aerial Observation of Oil Spills: Learn about the options that OR&R offers for oil spill aerial observation training. Aerial Observations of Oil at Sea [PDF, 60 KB]: Read this set of recommended procedures, published in 1996, for assessing spilled oil from the air. ITOPF: Aerial Observation of Marine Oil Spills: A Technical Information Paper (TIP) on aerial reconnaissance of marine oil spills, produced by the International Tanker Owners Pollution Federation Limited (ITOPF).